Ken Faunce joined the faculty at Washington State University in 2001 as part of the World Civilizations program. In 2012, he was part of the design team for the innovative Roots of Contemporary Issues program and piloted several issues in the new program. Faunce has received several teaching awards at WSU including, the Richard Law Excellence in Undergraduate Teaching Award (2016), Common Reading Excellence Award (2014), Martin Luther King Distinguished Service Award for Faculty (2014), First Year Focus/Living Communities Excellence Award (2013). 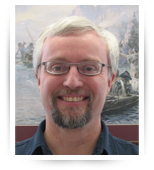 Faunce earned his Ph.D. in History & Historical Archeology from the University of Idaho in 2000. He received a Master’s in History (1992) and a Master’s in Anthropology (1992) from New Mexico State University. He worked for seven years as a historian and archeologist at Fort Bliss, Texas. Along with four other current and former members of the RCI faculty, Faunce is under contract to develop a Roots of Contemporary Issues book series with Oxford University Press. His main areas of research are nineteenth and twentieth century U.S. history with an emphasis on globalization. His current primary areas of research are gender studies, race/ethnicity, and the history of drugs.